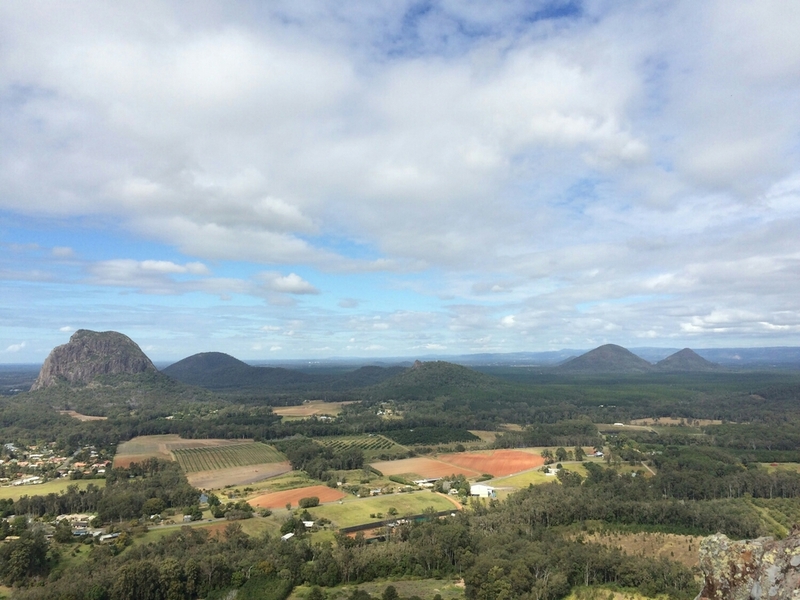 The Glass House Mountains are an ideal stop between Brisbane and the Sunshine Coast. 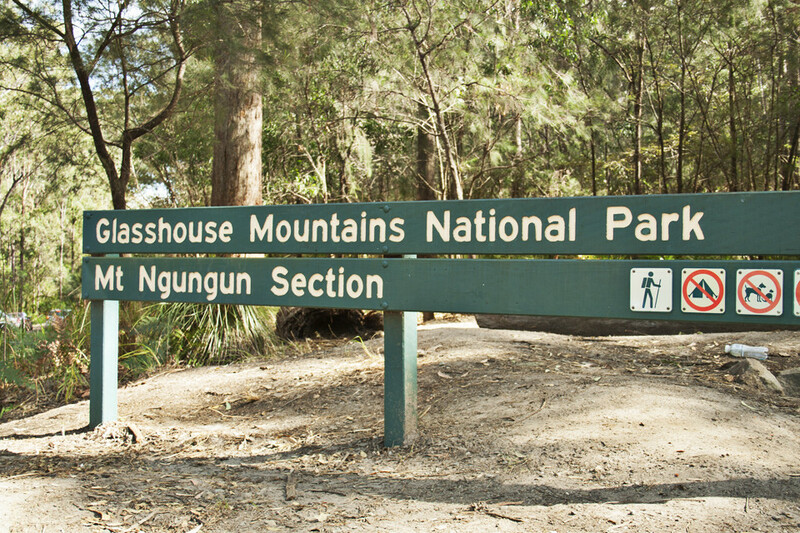 Unlike the world-famous Australia Zoo nearby, the Glass House Mountains are in a National Park and thus free. Captain James Cook (the man who “discovered” Australia) coined the name Glass House because the mountains reminded him of glass furnaces back in England. The mountains are in the traditional lands of the Aboriginal tribes Jinibara and Kabi Kabi. In their legends, the mountains are all the members of a family. The father’s anger at his eldest son explains why he faces away from the whole family. After stopping for the obligatory coffee and croissant, we found the park’s information center. Some friendly staff – one a Californian – gave us the low-down on the high-ups. We decided to climb Mt. Ngungun, since it was only a two-kilometer hike to the top. Several runners, families, and hikers crowded the trail up the mountain. The trail was good, and the steep, rocky bits only occurred at the top. Once there, the view was incredible. We could see all the other mountains plus the eucalyptus forest and surrounding farmland. The mountains stand apart, independent from one another; there’s not much of a range. The hike down was much quieter than the uphill; the families must have broken for lunch. From the bottom, we continued down the road to the scenic lookout, although Mt. Ngungun was plenty scenic for us. A nearby sign described the family story of the mountains. We enjoyed a very American PB&J at the nearby picnic tables. We haven’t quite warmed up to Vegemite yet. I’m not holding too much hope for it. Maybe, just maybe we’ll warm up to that most Australian of brown yeasty spreads.